Indian Motorcycles revealed its latest addition to the family this past weekend: a blacked-out, lower-cost big V-twin known as the Chief Dark Horse. Maintaining the same chassis and critically acclaimed Thunder Stroke 111 engine as the Chief Classic and Chief Vintage, the Chief Dark Horse has been stripped of almost all its chrome in favor of a matte black finish that seems to highlight the bike's art deco styling influences. With the new look comes a new price. At $16,999, the Chief Dark Horse is $2,000 cheaper than the Chief Classic ($18,999) and costs $4,000 less than the Chief Vintage ($20,999). 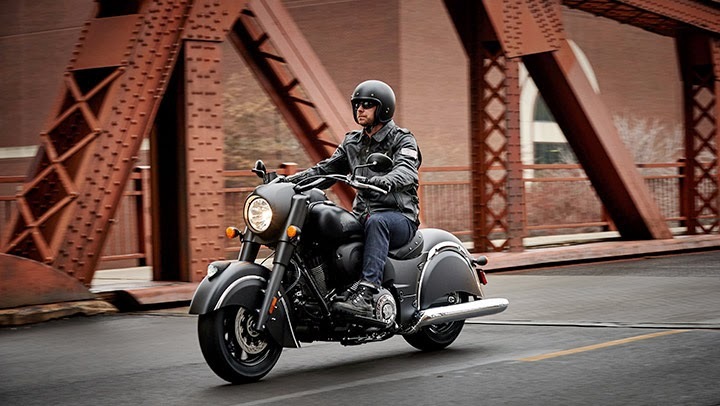 The Dark Horse maintains the same ABS and cruise control features that come standard on other Chief models, but in addition to living without chrome its riders will have to make due without a light bar, fuel gauge, passenger seat and oil cooler. Additionally, the seat on the Dark Horse is vinyl, rather than the pure leather found on more expensive models. Indian says it is hoping to capture a slightly younger demographic with the look and price of the Dark Horse. Indian Motorcycle Senior Product Manager Ben Lindaman said that the typical Chief owner is 55 years old or older. With the Dark Horse, he said, the company is hoping to reach riders who are "around 40." Riders of all ages will be able to get their first chance to demo the bike at Daytona Bike Week, which takes place 7-14 March.